Row 3 is done! Yeah! I’m more than halfway through the Sewcial Bee Sampler quilt! The time has flown by and the blocks have been a joy to piece. 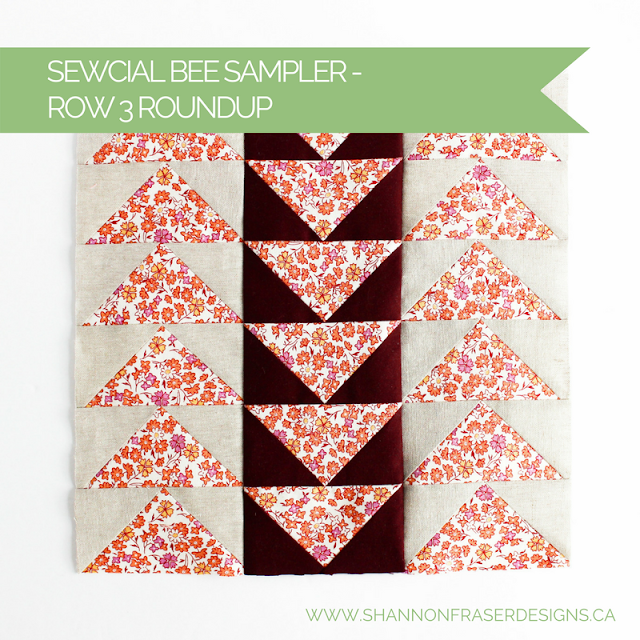 It’s also been really fun picking my fabrics for each block. 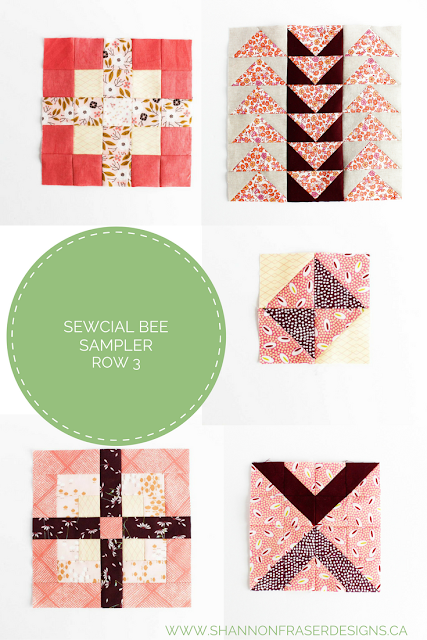 As the title suggests, this week’s post rounds-up the 5 blocks featured in row 3 of the SBS. Which means, that only leaves us with 2 more rows to go. Woot woot! In case you missed them, you can see Row 1 and Row 2 here and here. Hopefully I can pull it off cause I’m really loving how this quilt is coming along. Hoping it all doesn’t go south when I start adding the borders and sashing!! In the suggested layout, row 3 starts off with the Four Square block. I love the boldness of the central plus in this block design. I decided to enhance that “+” even more by using He Loves Me Plum which is a nice deep burgundy. This was balanced out with lots of pinky coral tones and a little soft yellow. I’m curious to see what border colour I end up choosing for this one. 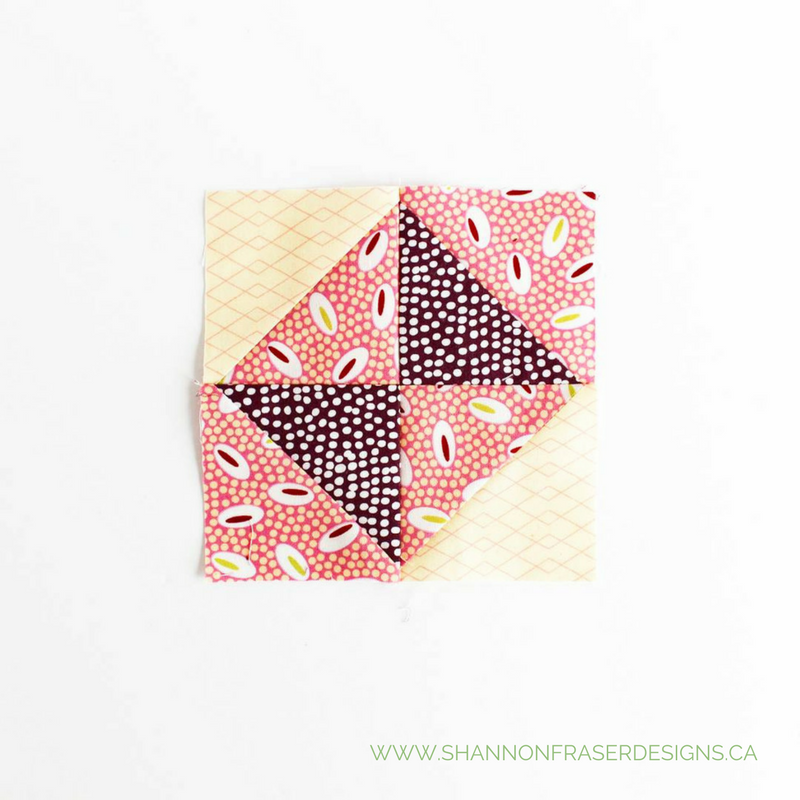 The Flying Geese quilt block pattern called for 4 different fabrics, but I was curious to see what the floral fabric (that has yet to be named!) would look with the contrast of the solid maroon and the linen. 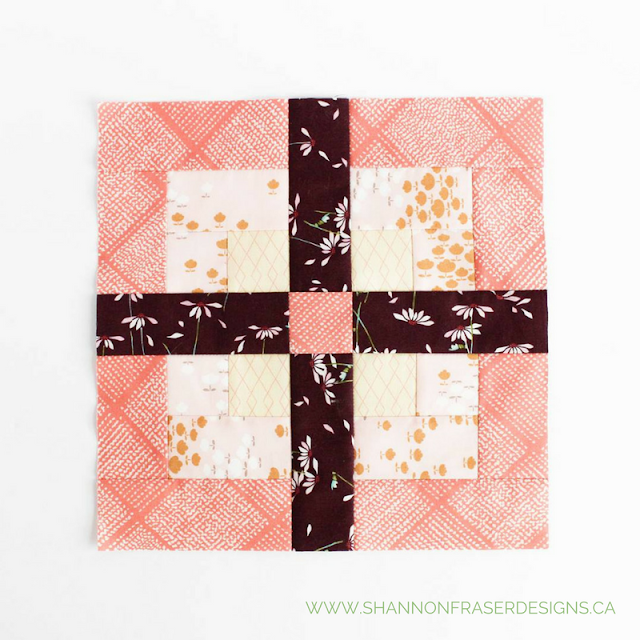 This happens to be a block without any borders, so it was fun to incorporate the two colours I’m using for my borders here. I absolutely love how it turned out. 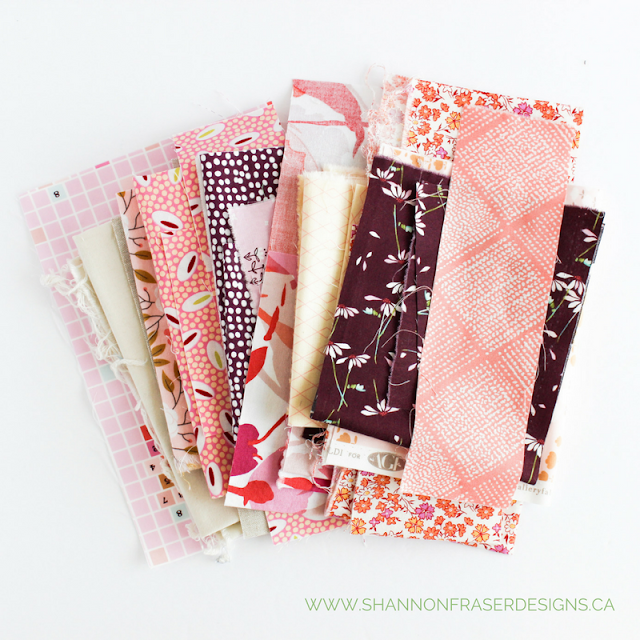 And I’m always amazed at how a patterned fabric can look quite different depending on what solid it is paired with. Makes you realize just how many options there are to choose from when choosing a quilt colourway. The Broken Dishes block was fun as it’s one of the first blocks I ever made. 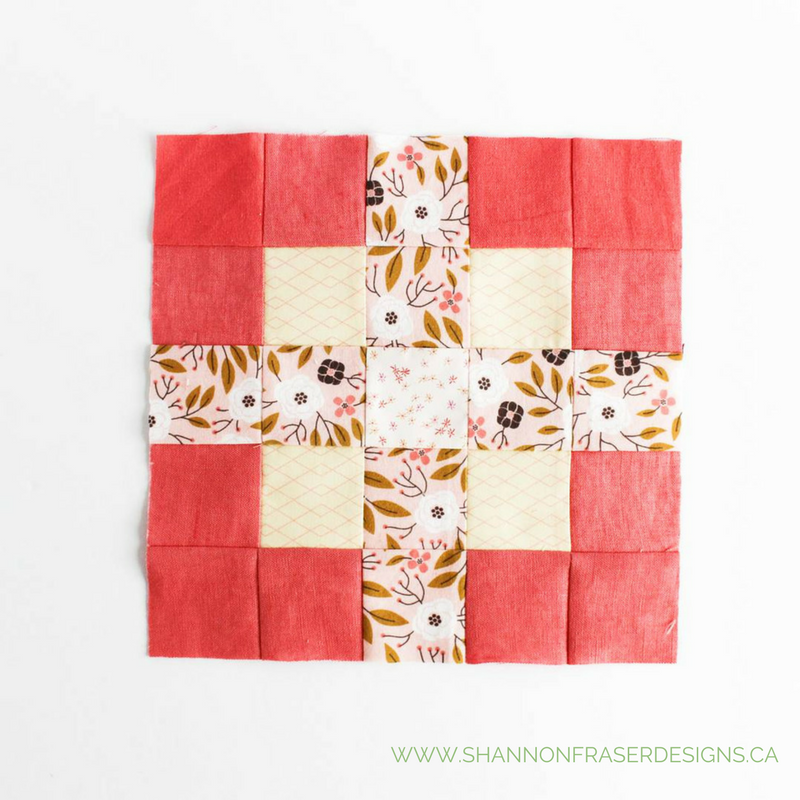 It was fun to revisit it and see how far I’ve come in my piecing skills! I didn’t fully understand how to nest my seams when I first started; what a difference that technique makes to getting perfect points (as opposed to stitching and hoping it all works out!!). How are your Sewcial Bee blocks coming along? Any favourites so far? I’m particularly fond of Dove in the Window and Wedding Ring, but that can all change as I work on the remaining blocks. 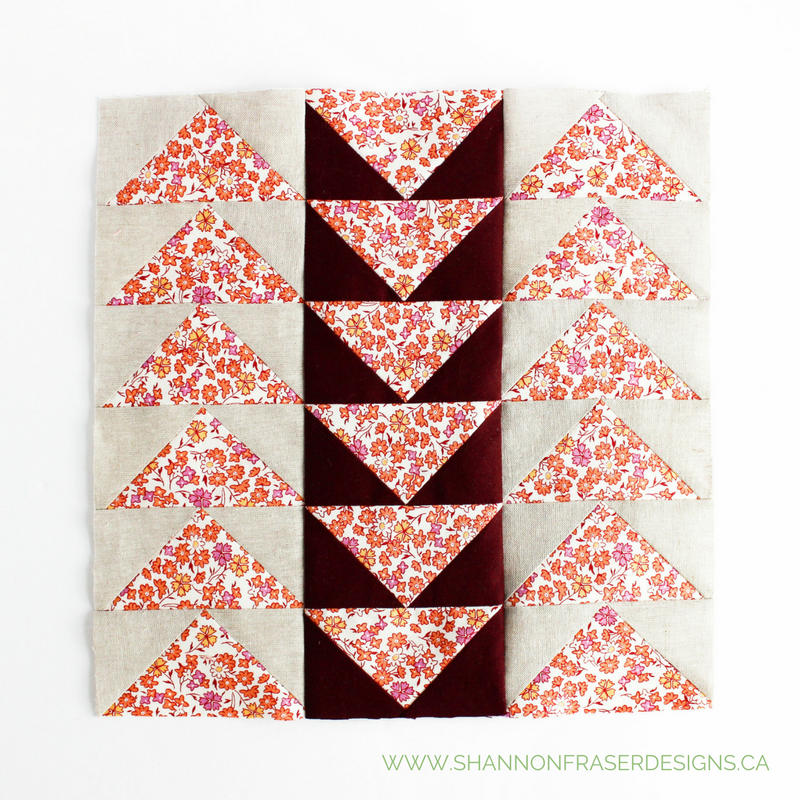 Still lots of good quilty time ahead! Haven’t joined yet? Hop over and visit Sharon or Maureen’s sites to learn more and get started today! I really love the palette you are working with; it's so fun to see brown used when so many people shy away from it. Good luck making the most of the fabric you have remaining!! I love love love those colours Shannon! Thanks, Izzy!! 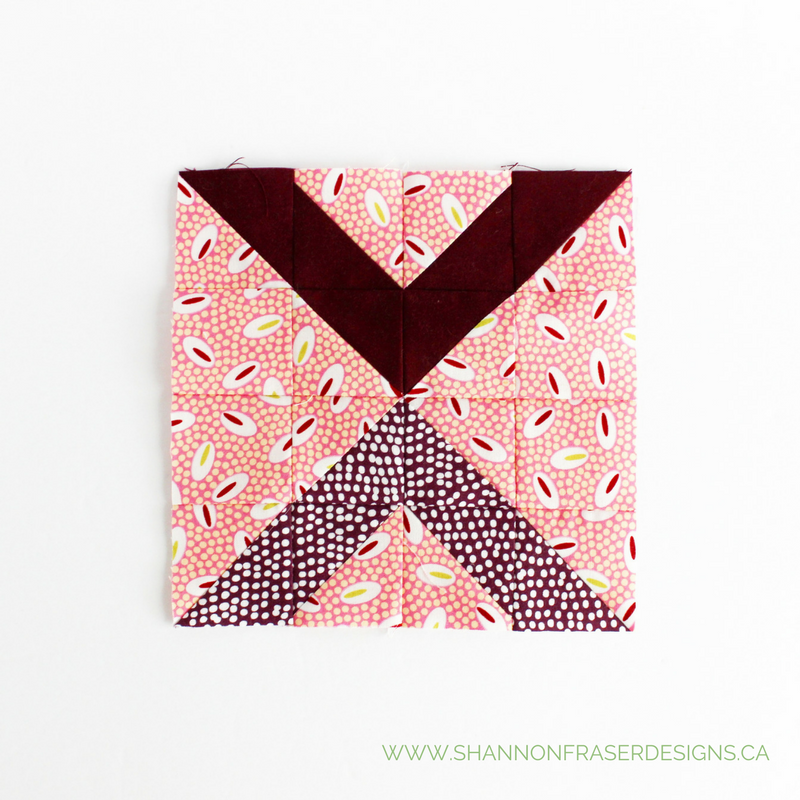 It's really been such a fun quilt along - you should totally give it a go! !